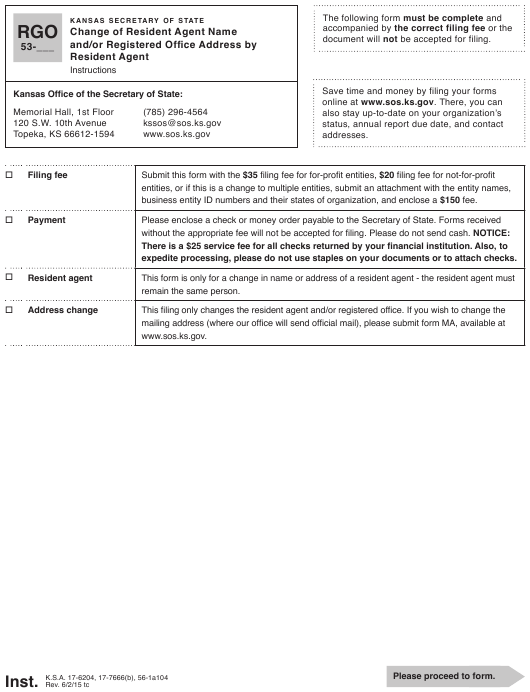 Form RGO53 or the "Change Of Resident Agent Name And/or Registered Office Address By Resident Agent" is a form issued by the Kansas Secretary of State. The form was last revised in June 2, 2015 and is available for digital filing. Download an up-to-date fillable Form RGO53 in PDF-format down below or look it up on the Kansas Secretary of State Forms website. document will not be accepted for filing. business entity ID numbers and their states of organization, and enclose a $150 fee. expedite processing, please do not use staples on your documents or to attach checks. This form must be complete and accompanied by the correct filing fee or the document will not be accepted for filing. that I have remitted the required fee. Please review to ensure completion.